The Atlanta real estate market has already started to take off in 2017, led by a jump in list prices, which spiked 13.7% from the year prior. New listings are being priced higher because inventory is still down (-8% YOY), and demand from homebuyers remains strong. A recent drop in mortgage rates has only encouraged buyers looking to participate in the upcoming spring buying season. Sale prices continue to increase, days on market remain low, and more homes are selling than last year… all signs that Atlanta’s housing market is showing no signs of slowing down just yet. Just as we’ve seen in the past, the average sale price was down in January, compared to the month prior. The five percent month over month decrease may seem drastic, but it’s right in line with what we’ve seen during the same period over the past four years, so it shouldn’t be cause for concern. However, general home price appreciation has continued to slow. Currently, home prices are increasing annually in the 5-6% range, matching historic averages over the past 50 years. The average sale price of single family attached and detached properties in January was just under $260K. After experiencing a run up in price from September through the end of the year, the average price dropped five percent to bring in the new year. As I previously mentioned, we’re still seeing average year over year sale price increases. From January of last year to January of this year, residential real estate prices in Metro Atlanta rose 5.2%, from $246,415 to $259,127. January is a slow month for home sales, but compared to last year, transactions were up 3.5%. Comparatively speaking, Metro Atlanta experienced a relatively stable number of real estate closings in January from 2012-2015. For example, there were 3,927 in (’12), 3,890 in (’13), 3,833 in (’14) and 3,865 in (’15). This year’s sales of 4,504 marks the highest number of properties ever sold in Metro Atlanta during the month of January. We’ve seen elevated sales volume over the past two years, so it’s a positive sign that the number of transactions is still increasing… even if only slightly. Buyer demand has remained high with the job & stock markets continuing to improve, interest rates remaining low, and a sustained appreciation in home prices. Volume will likely spike again in the coming months with the spring market right around the corner. The shortage of available homes for sale remains a strong driving factor in the Metro Atlanta real estate market. Down eight percent from the same time last year, the number of active listings continues to diminish. This downward trend is fueled by an increasing number of properties going under contract, at a quicker pace, resulting in more closed transactions. Despite increases in the number of new listings, less available inventory further restricts supply in a market where demand continues to grow. The chart above shows the steady decline in active listings over the past two years. Last month marked a five year low with available inventory dropping below 20,000 listings. At just 19,833 properties listed for sale, Atlanta’s active inventory was 8% lower than it was at the same time last year. To put things into perspective, just six years ago, in January 2011, there were nearly 49,000 active listings! Based on list prices, it looks like home prices are in for another year of solid gains. In January, the average list price of homes skyrocketed to $363,403. This represents a 13.7% month over month increase, and 15.9% higher than it was at the same time last year. A boost in average list price is typical this time of year, but this year's increase dwarfs those of the past. Last year, list prices only increased 6.9% from the year prior, making this year’s hike nearly double what we’ve seen in the past. Keep in mind, average list price data may not perfectly reflect list price appreciation in all areas of Metro Atlanta; but it does help forecast general increases in short-term sale prices. With median list prices also increasing around 11.1% year over year, it appears that sellers are highly optimistic about the value of their home. January’s low numbers for days to contract and contract to settle reflect the strong buyer demand that continued throughout the fall and winter months of 2016. At 36 days, the median days to contract was five days less than it was in January of last year. With the median days from contract date to settlement date also dropping by four days, this puts the total days on market from list date to closing date at 74. This means sellers should be ready to move when they put their home on the market, because most of them (properly priced) will be handing over the keys in about two and a half months! Remember, homes selling in January were actually properties that most likely went under contract in November or December of last year, since they took 38 days on average for the transaction to close. Therefore, you can expect the total number of days on market to drop in February (December & January contracts), then continue to decrease through the spring and summer as we reach the peak buying season; a time when demand is higher and homes go under contract much quicker. 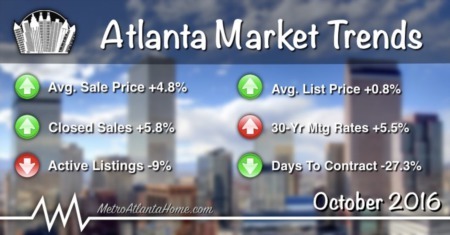 The so far this year one thing is evident, the cost, and subsequent value, of Atlanta real estate is going up. I say that because the price per square foot is a pretty good indicator of how much home you can get for the money. The list price per square foot of metro homes has steadily continued to rise since early 2012; now reaching $139. This is $16 more per sq/ft than it was a year ago, $22 more than the five-year January average, and $47 more than it was in January of 2012. Following the lead of list prices, the average sale price per square foot naturally followed a similar pattern. At $114 per sq/ft, the sale price price in January was $7 more than it was last year, but $54 more than January of 2012. That’s a 90% increase! The same applies to the median sale price per sq/ft, which has also skyrocketed in the past five years, more than doubling! 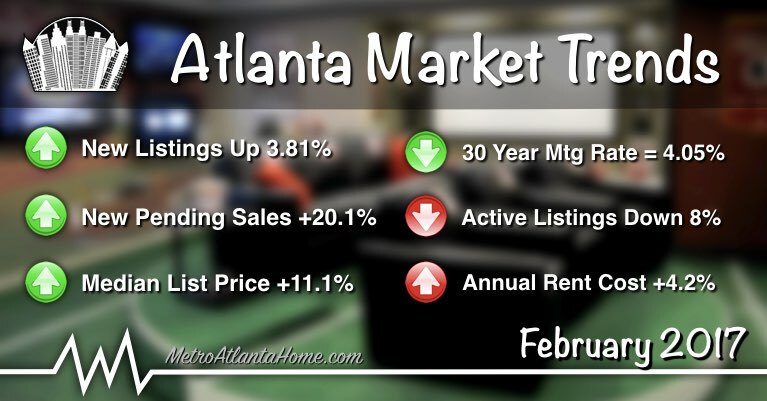 Current estimates show Atlanta home values in the month of February are up approximately 7.5% in the past year. If you’ve been thinking about selling, now is the time to take advantage of this seller’s market. Need to know what your home is currently worth? Check out our home value estimator tool for a detailed value analysis. Mortgage rates have dropped in the past month, but not quite as low as they were for the better part of 2016. With interest rates still under three percent (except for 30-year conventional loans), financing remains favorable for buyers just as the spring market begins to heat up. Despite the recent drop, many in the mortgage industry believe we will start to see interest rates rise at some point this year. Alpharetta: Last month there were 124 (+0%) homes sold in Alpharetta at an average sale price of $372,053 (+8.1%). The average days on market was 63, down from 70 a year ago. The number of new listings decreased 12.1% to 225, putting the number of total active listings in Alpharetta at 464 (+0%). Currently, the average list price in this area is $494,168 (+4.2%), at a price per sq/ft of $158 (+9%). Avondale Estates: Last month there were 8 homes sold in Avondale Estates at an average sale price of $355,238 (+21.4%). The average days on market was 24, down from 37 a year ago. The number of new listings was unchanged at 10, putting the number of total active listings in Avondale Estates at 16 (-40.7%). Currently, the average list price in this area is $321,640 (-18.2%), at a price per sq/ft of $153 (-5.6%). Brookhaven: Last month there were 53 (+15.2%) homes sold in Brookhaven at an average sale price of $511,319 (+9.1%). The average days on market was 61, up from 59 a year ago. The number of new listings decreased 13.3% to 98, putting the number of total active listings in Brookhaven at 210 (+1.4%). Currently, the average list price in this area is $545,837 (-2.5%), at a price per sq/ft of $211 (+3.9%). Buckhead: Last month there were 117 (-4.1%) homes sold in Buckhead at an average sale price of $612,347 (+11.6%). The average days on market was 92, up from 77 a year ago. The number of new listings increased 14.5% to 284, putting the number of total active listings in Buckhead at 735 (+9.1%). Currently, the average list price in this area is $923,593 (+20%), at a price per sq/ft of $298 (+13.7%). Chamblee: Last month there were 18 (+12.5%) homes sold in Chamblee at an average sale price of $332,018 (+30.7%). The average days on market was 51, up from 29 a year ago. The number of new listings increased 31% to 38, putting the number of total active listings in Chamblee at 42 (+27.3%). Currently, the average list price in this area is $348,783 (+18.8%), at a price per sq/ft of $192 (+20%). Decatur: Last month there were 23 (-14.8%) homes sold in Decatur at an average sale price of $433,798 (-10.2%). The average days on market was 57, down from 66 a year ago. The number of new listings decreased 17% to 44, putting the number of total active listings in Decatur at 76 (-16.5%). Currently, the average list price in this area is $486,483 (-16.1%), at a price per sq/ft of $228 (-6.9%). Doraville: Last month there were 5 homes sold in Doraville at an average sale price of $202,820. The average days on market was 56, up from 32 a year ago. The number of new listings increased 40% to 14, putting the number of total active listings in Doraville at 17 (-5.6%). Currently, the average list price in this area is $210,171 (+32.8%), at a price per sq/ft of $135 (+31.1%). Duluth: Last month there were 75 (+56.3%) homes sold in Duluth at an average sale price of $347,201 (+11.4%). The average days on market was 80, up from 52 a year ago. The number of new listings decreased 38.8% to 85, putting the number of total active listings in Duluth at 185 (-31%). Currently, the average list price in this area is $562,402 (+39.5%), at a price per sq/ft of $126 (+3.3%). Dunwoody: Last month there were 40 (+48.1%) homes sold in Dunwoody at an average sale price of $377,412 (+17.1%). The average days on market was 49, down from 59 a year ago. The number of new listings increased 30.4% to 73, putting the number of total active listings in Dunwoody at 122 (+17.3%). Currently, the average list price in this area is $420,104 (-0.2%), at a price per sq/ft of $173 (+3.6%). Johns Creek: Last month there were 62 (+26.5%) homes sold in Johns Creek at an average sale price of $422,371 (-5.8%). The average days on market was 67, down from 92 a year ago. The number of new listings decreased 12.5% to 119, putting the number of total active listings in Johns Creek at 301 (+6.4%). Currently, the average list price in this area is $518,643 (+1.4%), at a price per sq/ft of $149 (+6.5%). Lilburn: Last month there were 52 (+44.4%) homes sold in Lilburn at an average sale price of $222,758 (+13.7%). The average days on market was 42, down from 90 a year ago. The number of new listings decreased 10.9% to 49, putting the number of total active listings in Lilburn at 130 (-30.5%). Currently, the average list price in this area is $274,489 (+37.6%), at a price per sq/ft of $99 (+13.8%). Norcross: Last month there were 45 (-25%) homes sold in Norcross at an average sale price of $185,767 (+9.5%). The average days on market was 45, down from 58 a year ago. The number of new listings increased 4.8% to 66, putting the number of total active listings in Norcross at 105 (-23.9%). Currently, the average list price in this area is $212,155 (-12.8%), at a price per sq/ft of $101 (-2.9%). Roswell: Last month there were 83 (-9.8%) homes sold in Roswell at an average sale price of $412,033 (+10.5%). The average days on market was 65, down from 66 a year ago. The number of new listings decreased 5.9% to 159, putting the number of total active listings in Roswell at 312 (-9.8%). Currently, the average list price in this area is $473,720 (-3.3%), at a price per sq/ft of $157 (+6.1%). Sandy Springs: Last month there were 72 (-20.9%) homes sold in Sandy Springs at an average sale price of $439,602 (+7.4%). The average days on market was 70, down from 89 a year ago. The number of new listings decreased 0.9% to 215, putting the number of total active listings in Sandy Springs at 503 (+1.6%). Currently, the average list price in this area is $887,950 (+37.4%), at a price per sq/ft of $199 (+11.8%). Tucker: Last month there were 38 (+11.8%) homes sold in Tucker at an average sale price of $245,132 (+19.6%). The average days on market was 85, up from 63 a year ago. The number of new listings decreased 2.2% to 45, putting the number of total active listings in Tucker at 83 (-20.2%). Currently, the average list price in this area is $296,239 (+22.1%), at a price per sq/ft of $117 (+17%).